After a hard day at work, most people like to relax with a frosty beer in hand. But for some freight rail workers, taking care of your beer is their full-time job. In a rail yard outside of Chicago, temperatures can fall well below the 13 degree Fahrenheit freezing point for the product of the yard’s biggest customer — beer. As temperatures plunge, select train conductors ensure that the cars carrying this precious commodity are constantly kept moving, a process necessary to prevent damage to the cans and bottles when freezing occurs. Using remote control devices or manually switching out cars, train conductors keep the beer cars in motion, which is no small feat — especially in the months leading up to Cinco de Mayo when it is not uncommon to have 80 cars of beer in the yard at once. Four times more fuel-efficient than trucks, railroads are the most environmentally sound way to move freight over land. And, across America, locomotive engineers are working to keep it that way. Railroad engineers are not only schooled in the operation of 200-ton locomotives, they are also trained in smart driving techniques — anticipating terrain, coasting and reduced braking — that minimize fuel consumption and air pollution. Many railroad fuel conservation programs even reward participating locomotive engineers with a monthly percentage bonus on diesel saved per trip, which has helped achieve huge reductions in the railroads’ fuel consumption rate the last few years. Thinking about a career in law enforcement? Look no further than aboard America’s freight railroads. Railroad police forces date back to 1849 when they were set up to maintain order in railroad towns and to investigate the losses of freight and luggage. Two of the most famous railroad police officers, Allen Pinkerton and Wyatt Earp, were hired to investigate train robberies. While train robberies have become a thing of the past, today railroad police officers still investigate cases of theft and vandalism and patrol rail yards, depots and railroad property. Railroad police employ sophisticated surveillance technology and investigative techniques, such as the use of night vision, thermal imagers, K-9 teams and other equipment, to keep America’s railroads safe and secure. If you are a video gamer, you might feel right at home working for America’s freight railroads. Constantly working to develop new training technologies that simulate life in a locomotive cab, railroads have begun to employ video game technology to train a new generation of recruits. The first rail operations simulation program was actually developed by two young railroad workers, who turned their favorite hobby into a virtual training program that teaches employees to maneuver locomotives, operate switches, and sort cars onto different tracks depending on their destination. In mountainous states with heavy snow accumulation, avalanches are a common occurrence that can leave railroad tracks impassable for days or bury passing trains. Railroads operating in this tough terrain employ the help of avalanche experts to deal with whatever Mother Nature has in store. Using data from mountaintop weather stations and US Army 105mm howitzer guns mounted on Hirail cars, avalanche control teams routinely shoot the mountains in the area near railroad tracks to trigger controlled avalanches and prevent larger dangers. 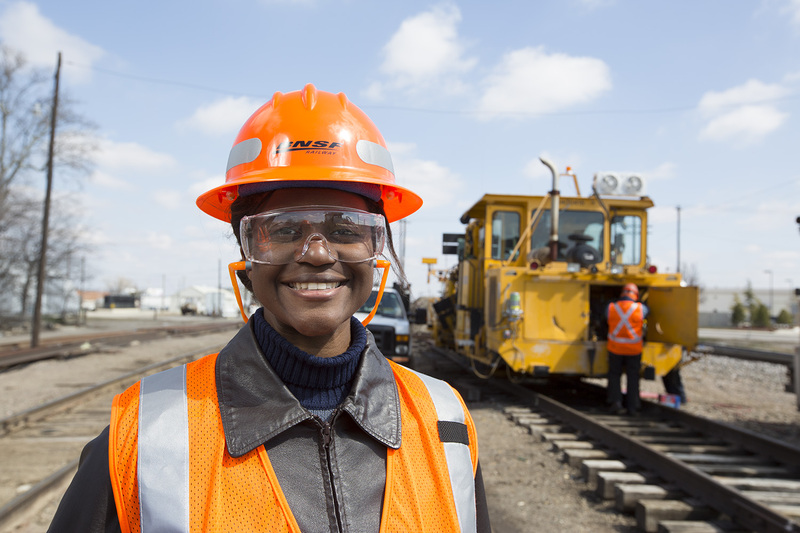 Safely and efficiently delivering for America requires a large, diverse team of roughly 165,000 people across the rail network. See how women help lead the charge.